Last Saturday night the 18th annual Aurealis Awards were held at North Sydney's Independent Theatre. Margo Lanagan scooped the pool. Check out my Flick set. It's been so long since I posted on LJ, I've almost forgotten how it works! 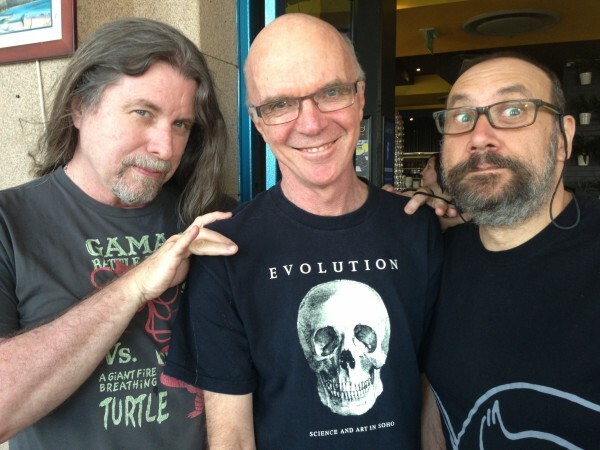 Took this snap at Darling Harbour, Sydney, yesterday: Bob Eggleton, Rob Hood and Nick Stathopoulus. Three monster boys! 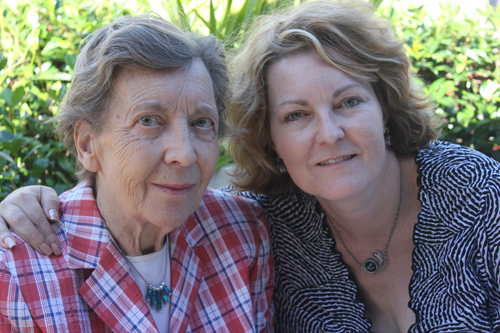 My Mother, Betty Lorraine Sparks, passed away yesterday morning after a six-month battle with cancer. Rest in peace, Mum. Miss you so much already. Originally published at www.catsparks.net. You can comment here or there. Dad’s been sorting through his drawings and Mum pulled this one out of the pile and gave it to me yesterday. 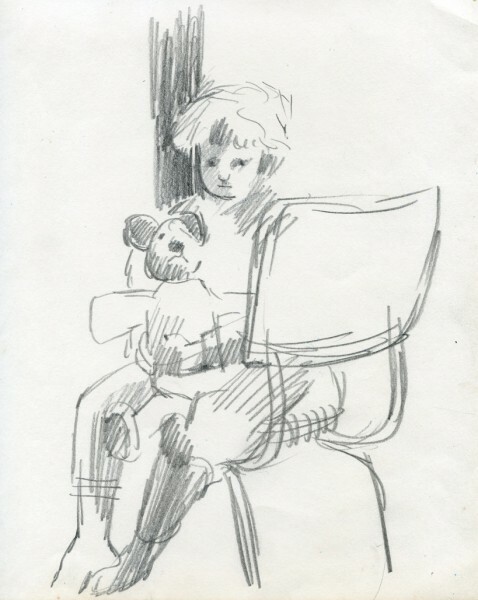 Three-year-old me with a favourite toy, Scotch Teddy, who was pale blue with tartan pants. The expression on Ted’s face as drawn by Dad is exactly as I remember it. As you can see, I haven’t changed a bit. Originally published at www.catsparks.net. Please leave any comments there. 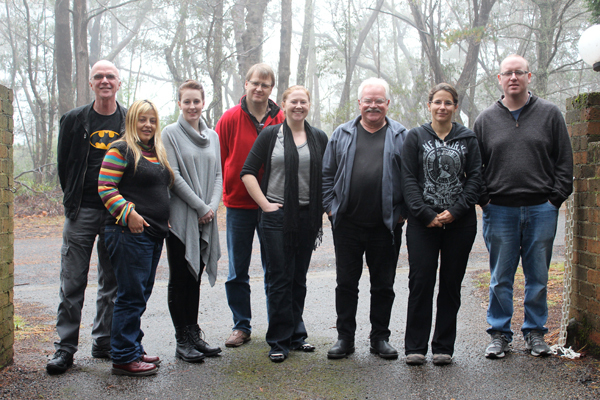 Last weekend Terry Dowling, Rob Hood and myself tutored a charming bunch of writers on retreat in a far off land. OK, so Blackheath isn’t actually all that far from Sydney — a stone’s throw past Katoomba, in fact — but what with the rolling John Carpenteresque fog and the lack of wifi & all, it might as well have been a boggy moor in Scotland. Pictured: Robert Hood, Chris Beale, Alice Hoving, Roger Garner, Corinne Cavanagh, Terry Dowling. Carole Thierion de Monclin & Daniel Nunn. This isn’t my only bookshelf, of course, it’s one of many. The back room is chockers with the things, both double and triple banked. When my parents sold the family home, my father gave me this one from his study and I put it on my second desk and filled it with some of the titles that had been accumulating on the table beside my reading chair out back. The awards were held last Saturday May 12 at the Independent Theatre, North Sydney. Loads of smiling faces and sparkly frocks. Check out my Flickr stream here. 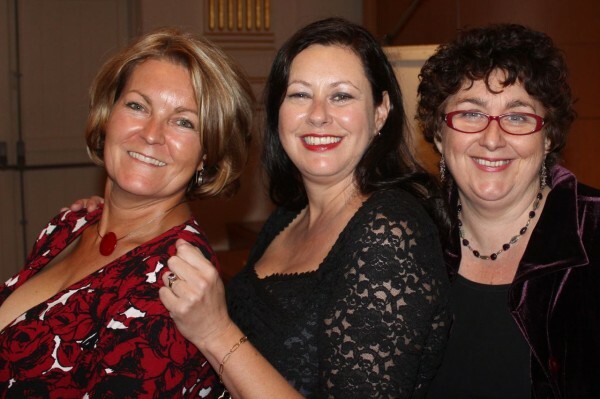 Pictured: Double award winner Lisa Hannett, me & Liz Gryzb. Paul’s family invited me to speak at his memorial service. This is what I said. Paul Haines was not just another writer. He was the kind of writer who is rarer than you’d think: a writer who actually had something to say. The term ‘unique voice’ is often overused, but in his case it was true. Paul inspired trust in all who knew him. Grateful for the inclusion he experienced from more established writers early on, he made a point of extending the same friendship and courtesy to newer writers following behind. Paul focused a spectrum of disturbing truths though the prism of his lens. His writing style was tough, mesmerizing, visceral, no holds barred. In a word: authentic, just like the man himself. He wrote with certainty and strength. Sympathetic to tragedy, he enticed us to engage with and acknowledge elements of the dark within.